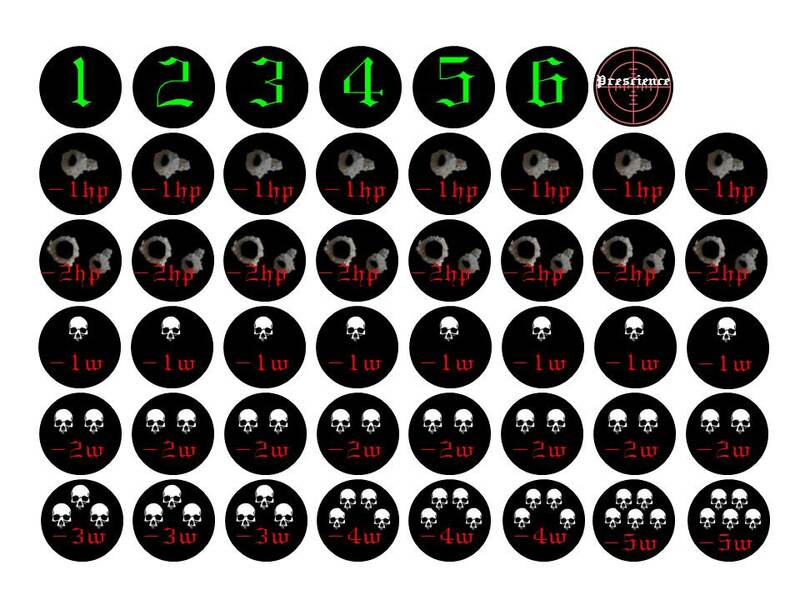 As many of you know by now having numbered 40K objective markers is required to play Maelstrom of War missions. I got tired of sticking dice on top of my current markers and decided to make some new ones. 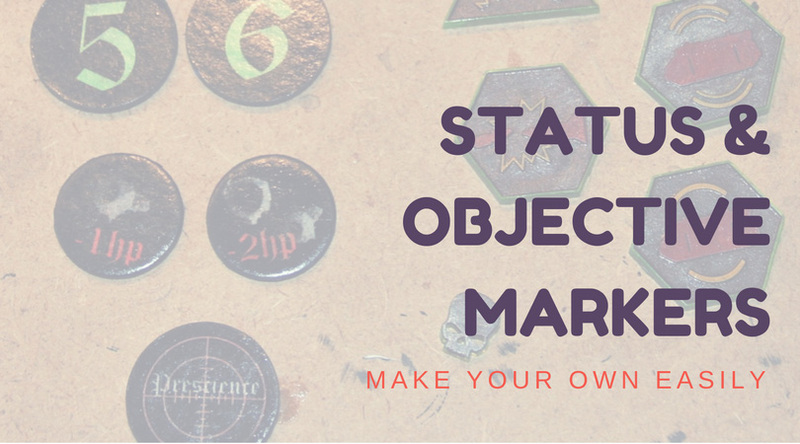 I like Thor’s objective markers because they are simple and easy to read, but I decided to go even simpler. I printed some numbers, glued them to some wooden disks, and gave them a couple of coats of acrylic floor polish. While I was at it I made a marker for Prescience and some hull point markers. 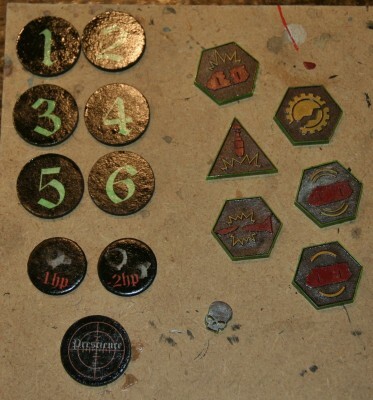 The hull point markers are on slightly smaller cardboard disks. I made about 8 each of -1 HP and -2 HP. I also painted my GW 40K status markers. I’ve been using them for a while and had painted them a rusty metallic color to distinguish them as mine. They were a little hard to read from a distance so I added some color to make them more visible. Fancy themed 40K objective markers look great, but I feel like I should finish painting my army before I put that much effort into 40K objective markers. Speaking of which, I’m making good progress on my Devil Dog model. I’ll post picture of that for my usual Monday post. Simple and effective is good for game counters. What are you using for yours? Nice job. I think they look great and should be easy to find on the table. I also like the vehicle HP marker idea. Think I’ll steal that one. The one thing I’ve been trying to work out is a good way to do wound markers on small models. I have the skulls like you do and trying to get 2-3 on a base sometimes just doesn’t work out well. Thanks. I made the -2 HP markers because it will be cleaner than adding multiple -1 HP markers on a vehicle. There aren’t a lot of 4 HP vehicles so I didn’t bother making -3 HP markers but it would be easy enough to do so later. I want to use the same approach for wounds. I just haven’t decided whether to make some -2 wound markers or repaint a couple of the skulls for that purpose. Once printed I add double sided tape on the back and sellotape on the front, for gloss finish. I stick them onto black mounting card, of the sort that is black all the way through. I then cut them out and should any white edges be showing use a black marker to make them neat and tidy. The square markers are easier to make and the edges bend less but the triangular ones can point to the model that is wounded. They’re small enough not to get in the way, cheap enough that even if you leave them all you can print another set. Give them a go, even if you don’t find them right for you you can gift them to your next opponent. I actually saw those and considered them before making mine, but I already had a bunch of disks sitting around so I wanted mine to be round. I’m glad you put your link here as I’m sure people will find it useful. 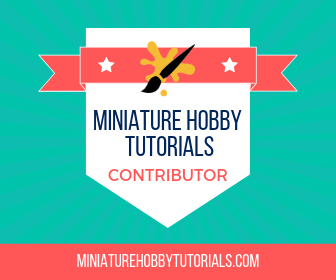 I am planning to use some of your building templates when I start making terrain again. Thanks Kamui, let me know when you get round to the buildings, it’s always interesting to see other people’s take on them. I will definitely make a post out of it when I get there. Those look great. Now to get some more ink for my printer. Nicely done. Does the high gloss make them hard to see at a glance under overhead light? My plan is to either make up a bunch of 40mm bases with Marine backpack standards on them (numbered) or simply paint numbers on 40mm bases. Thanks. I’m not sure how much of a problem the glare will be. Where I took this picture the table is lit by three LED lights that hang fairly low. It isn’t as noticeable in dimmer light but I haven’t really tried them out on a gaming table yet. If I find they’re hard to read I’ll give them a coat of matte sealer to cut the glare. I like the backpack standard idea. They will be easy to see and anyone who plays marines is likely to have a bunch of them sitting around. I went with flat disks so they’ll easily fit with my other markers. Always looking for new marker selections…so much stuff to keep track of these days. I need to hurry up and print Dave’s :). I added mine above for anyone who wants to use them. Dave’s should be easier to put together though since straight lines are easier to cut than circles.